Past Master Alistair Nicol was presented with his Grand Lodge Rank Certificate as Grand Architect on Friday 5th December 2014 by the Provincial Grand Master of Renfrewshire East Bro. John Samuel Miller. 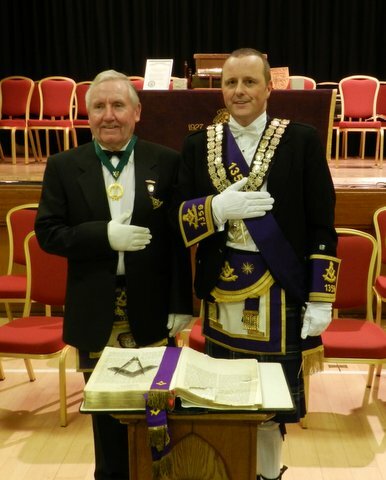 The Right Worshipful Master Bro. 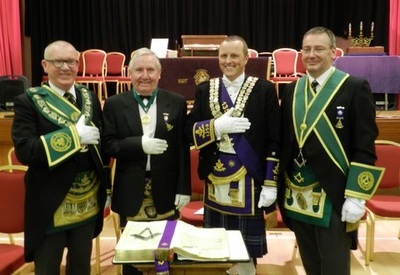 Mark Ridley PM invested Bro. Alistair with a Grand Lodge Rank Jewel on behalf of the Lodge. PM Bro. Alistair was very surprised at the award and had no idea it was going to happen on the night. It was a very proud night for both Bro. Alistair and Lodge Saint Conval, Giffnock. The award being made on the 5th December 2014 was very apt as it is Alistair's 84th birthday the next day. Bro. 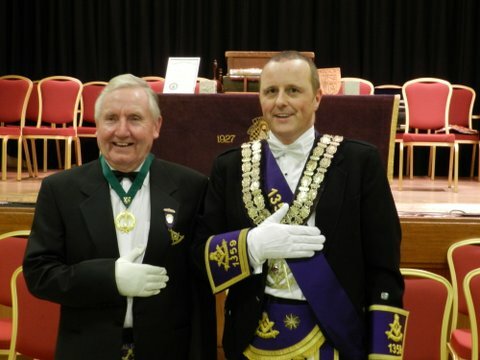 Alistair also completes 50 years service to the Lodge in January 2015 which will be another special evening. Past Master John Ross was presented with a Grand Lodge Rank Certificate as Grand Architect at the Annual Installation on Saturday 9th January 2016 by the Provincial Grand Master of Renfrewshire East Bro. John Samuel Miller. The Right Worshipful Master Bro. James Bruce invested Bro. John with a Grand Lodge Rank Jewel on behalf of the Lodge. PM Bro. John was very surprised at the award and had no idea it was going to happen on the day, he was nearly speechless. It was a very proud night for both Bro. John and Lodge Saint Conval, Giffnock. The award made was very apt as Bro. John next year completes 60 years service to the Lodge and Freemasonry which will be another special evening.